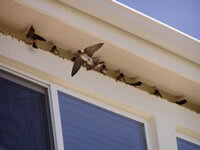 Swallows feed on insects and spend a large part of each day in the air catching flies, beetles, and mosquitoes. Their long pointed wings give them great speed and maneuverability. Normally, swallows are not seen on the ground except when collecting mud for their nests. Most do not have musical voices but only twitter or squeak. These small, nimble birds enjoy special legal protection. Once they have laid their eggs in the nest, you can not disturb them. 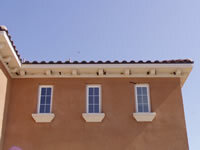 You must wait until they leave to remove the nests and then exclude them using BirdSlide installed along the underside of the eaves at an angle to prevent them from building their nests there the following year. Swallows and their nests are fully protected under the Migratory Bird Treaty Act of 1918, which makes it illegal to intentionally kill, injure or take any migratory bird. It is illegal to intentionally damage or destroy the nest, eggs, or young of a swallow while it is being built or in use. The Act allows fines or prison sentences for every bird, egg or nest destroyed. Cliff swallows and barn swallows are slender, sleek birds that spend their spring and summers in North America. Swallows are very territorial and will return to the same nesting site over and over. Buildings, eaves and other structures often replace cliffs these days to build their distinctive mud pellet nests (see photo at right). 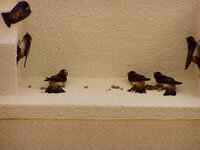 Swallows have brownish red faces and light colored bellies. Cliff swallows have squared off tails, but barn swallows have long forked tails (see top photo). Young swallows have similar coloring, but lighter. Swallows are small birds with dark glossy backs, red throats, pale under parts and long distinctive tail streamers. They are extremely agile in flight and spend most of their time on the wing. They are widespread breeding birds in the Northern Hemisphere, migrating south in winter. Recent declines due to loss of habitat quality in both their breeding and wintering grounds mean they are an Amber List species. Amber-list species are those with an unfavorable conservation status in Europe; those whose population or range has declined moderately in recent years; those whose population has declined historically but made a substantial recent recovery; rare breeders; and those with internationally important or localized populations. Swallows are often a nuisance in suburban areas as they build their mud nests that damage and deface the outer walls and eaves of residences and office buildings. 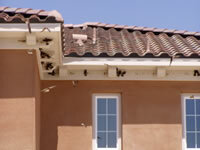 Swallow feces often end up on the sides of buildings and the ground below from the colony of birds in residence. Building owners report extra clean up costs and concern over slip and fall liability from swallow dropping buildup, plus an unclean, dirty company image. The bacteria, fungal agents and parasites found in swallow droppings and nests can carry hosts with serious diseases, including histoplasmosis, encephalitis, salmonella, meningitis, toxoplasmosis and more. 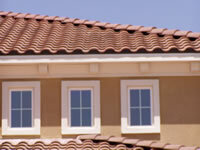 There are many swallow proofing products and techniques used to prevent swallows from nesting. The proofing is usually done after legal removal of the swallow's nest is finished. Many pest control companies use netting, wire, and scare techniques. Abolish uses a more effective proofing product without visually sacrificing your homes exterior. The use of nets, bird gel and wiring is not only ineffective at times, it is also unpleasant to the eye. Abolish is a certified BirdSlide installer. Birdslide, The effective way of preventing Swallows from nesting.